Sometimes you make a discovery that makes your heart sing. One such moment for me was finding the Spencer graves in the village churchyard in Sapcote in Leicestershire. 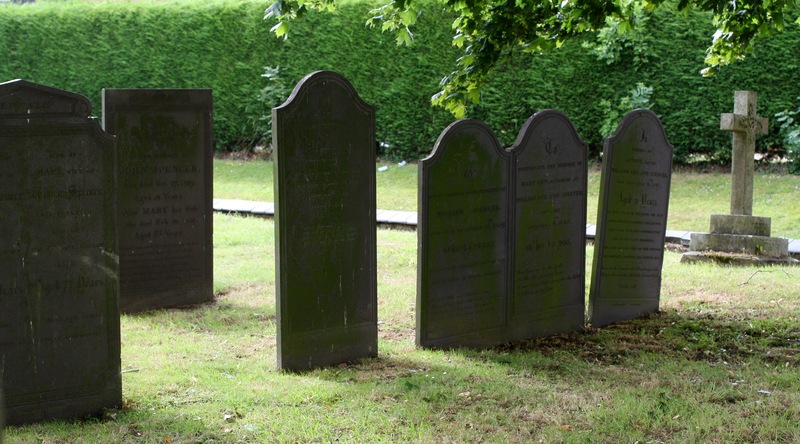 Here unexpectedly were four generations of my family, resting side by side, with a line of seven beautiful headstones, dating from 1801 through to 1887. As I read the inscriptions in the deserted churchyard on that wild, wet autumn morning, I felt I had found this family. The inscriptions are beautiful and, in many cases, personal, giving a sense of the people, the lives, the joys and the tragedies. Sacred to the memory of Thomas Spencer and Mary his wife both natives of this parish. He departed this life December 20th, 1810 in the 65th year of his age. She departed this life June 2nd, 1805 in the 61st year of her age. Also of Thomas, Kitty and Thomas sons and daughter of the said Thomas and Mary Spencer, the latter of whom departed this life March 31st, 1801 in the 19th year of his age, the two former died in their infancy. The stars shall fade away, the sun himself grow dim with age and nature sink in years but we shall flourish in immortal youth unhurt amidst the war of the elements, the wreck of matters and the cruelty of the world. Beneath are deposited the remains of William Spencer, who departed this life 17th January 1824 aged 51 to whose memory a tablet is erected in this church. Also of Mary, wife of William Spencer she departed this life 27 February 1848 aged 77. Mors est certa tempus incertum. 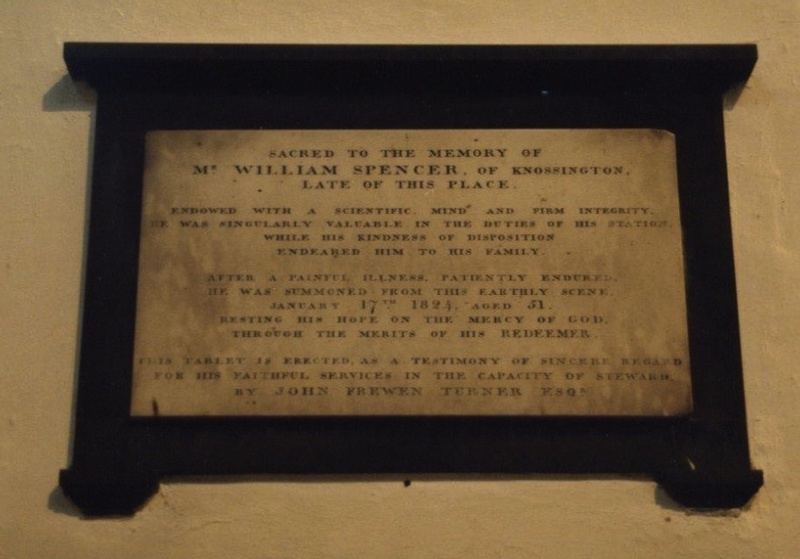 In affectionate remembrance of William Spencer who died February 23, 1839 aged 43 years. Arthur and Charles sons of the above died in their infancy. Farewell wife and children dear who I have left with grief and care but God for you will provide if you make him your only guide. In loving memory of Ann relict of the late Mr William Spencer who entered into her rest October 8, 1887 aged 83. Life is real life is earnest and the grave is not its goal. Dust thou art, to dust returnest, was not spoken to the soul. To perpetuate the memory of Mary Ann daughter of William and Ann Spencer who died February 6th 1845 in her 7th year. Our days are like the grass or like the morning flower, if one sharp blade sweep o’er the field, it withers in an hour. In memory of Arthur son of William and Ann Spencer who died on July 6, 1847 aged 11 years. In the cause of missions he had long been a careful collector and self-denying contributor and in his last moments he laid at the feet the Church Missionary Society his little all. Love of the Saviour stirred him to provide help to the souls for which the Saviour died. Christ is all. At the end of February, University College London made available an important online database: Legacies of British Slave Ownership. The records of 46,000 compensation claims made by British slave owners, following abolition of slavery in the British colonies in 1833, have been meticulously recorded, summarised and indexed. Here, for the first time, the true extent of the involvement of pre-Victorian Britain in slavery has been laid bare – and it makes uncomfortable reading. No longer can we think in terms of slavery being the responsibility of relatively few heartless, even “evil”, rich traders. Here is the indisputable evidence of how deeply all levels of society were implicated, with “ordinary” people, who had never set foot in the colonies, claiming compensation alongside the planters and owners. It also serves as a reminder of the iniquity, even post-abolition, of a system that allowed slave owners to have not only the free labour of their “freed” slaves through the “apprenticeship” system, but also the equivalent of millions of pounds in compensation for their loss of “property”, while the enslaved themselves received nothing. Such revelations will always, quite rightly, lead to a renewed examination of the place and role of slavery in building Britain. I was less prepared for the way this was personalised in the media. Newspapers started to “name and shame” those with ancestors mentioned in the records, both living and dead. You will rarely find me defending British Prime Minister, David Cameron, but to accuse him of benefiting from slavery because of compensation paid to a 6x removed cousin 180 years ago, seems extreme. Did his family actually inherit any of this money – or was this just a cheap attempt to score political points from even the most tenuous connections? Even genealogists were not immune. In spite of the unquestionable value of these records to family historians, some still felt the need to distance themselves. For instance, the well known Lost Cousins website headlined its report of the database: “You DON’T want to find your ancestors here….”. Oh that we could be so selective about our ancestry. My problem is that I did find my ancestors here. It was not entirely unexpected. I knew that my 4x great-grandfather, Dr David Shaw, had owned a small plantation in Jamaica. Strange how even as I write it, I feel the need to qualify it. It was just a small one, as if misery multiplied in 10s rather than 100s or 1000s of lives enslaved is somehow less shameful. I have researched his story and that of his family in depth – part of the process of coming to terms with a heritage such as this (that story will be told here in due course). It has been an uncomfortable and, at times, difficult exploration. But I cannot pretend that it has not also been compelling. For it has revealed contradictions. How can I reconcile the heroic Jacobite family, who fought at Culloden in an attempt to free oppressed Scottish Highlanders, making their fortune on the oppressed backs of another people? What warped logic did my mixed-race 4x great grandmother adopt to make it acceptable for her to enslave people like herself? What went through the mind of her clergyman son, married into a prominent Quaker family, as he took his cut of the profits of misery? How did his Quaker wife respond? Did anyone in the family raise objections? The UCL database has filled in a few more details of this complex family, allowing me to add to the emerging picture of tensions, conflicts and sibling rivalry that I have been gradually constructing. They suggest answers to some questions and raise several more, which I hope a trip to the Archives to see the records in full may start to answer. I cannot say that I like the picture that is emerging, but I need to complete it as far as I am able. Pretending that it did not happen will not make it so. My pre-Victorian ancestors indisputably profited from slavery. They shared (between 5 siblings) compensation of £895 16s 11d, which, even taking the most modest interpretation of relative worth, equates to some £65,000 today. So did their descendants also benefit? That is an interesting question and one that I am tracking through the wills and family circumstances of subsequent generations. But initial investigations suggest perhaps not. Within a decade one (my direct ancestor) was bankrupt and another was dead of the “disease of poverty” Tuberculosis, together with his wife and son. There is little evidence that much, if anything, passed to the next generation. So what happened to their “profits of misery”? Bad business investments, alcoholism and gambling have all been mooted in family lore but the truth is that as yet we don’t know. That it does not appear to have remained in the family beyond the mid-19th century is a source of relief to me, yet I recognise it is not so simple. The money itself may be long gone, but the legacy given to my family in terms of social position, education, professional standing is not so easily wiped out and makes the whole issue so much more complex for later generations. I cannot undo the past or change my ancestry. And I am not responsible for the actions of my forbears. But, in finding out all I can about their lives and, where possible, those they enslaved, I can at least do my part to expose and better understand this shameful part of our history. So we reach the end of February – and the end of the Family History Writing Challenge. How did that come around so quickly? So what have I achieved? Well my original idea of blogging daily on the alphabetical theme fell by the wayside very quickly. As soon as I started to write I realised that my stories would take more than a day or two to do justice to – a lot more. In the end I have written just one complete story and am nearing completion of my second. The material is proving to be rich and I am enjoying exploring different ways of writing it. I have realised it is not a race. I have immersed myself once again in my research, and have uncovered new connections and ideas. I set a target of 250 words a day and, except for a planned weekend off at a conference and a day when I had a big work deadline (when I wrote a lot – just not family history), I have managed at least that. It has been a welcome discipline and yet modest enough not to frighten me away from the task. There was never a time when I felt 250 words was too daunting a prospect. Indeed, writing just a small amount felt playful, as if I was freed from the constraints of time and deadlines and quality control to which my writing is usually subject. The Family History Writing Challenge has reminded me that I am a writer. Writing has always been a fundamental part of my life, from childhood story telling, to my adult world of text books, articles and proposals. Somehow I had allowed myself to dismiss my writer-self – even through I spend half my working life writing one thing or another. I was not a writer because I only wrote academic papers. I was not a writer because I didn’t write fiction. I was not a writer because textbooks somehow don’t count. This month I have remembered I am a writer. I have acknowledged it and embraced it and even shared it. Perhaps even more importantly, I have rediscovered the joy of it, the flow of it, and celebrated the pleasure of crafting words and weaving stories. So what happens now? I plan to keep writing my family history. Not every day (though I plan to keep up the daily writing habit) but regularly, maybe 2 or 3 times a week. I will finish my second story then take stock. Whether I write shorter posts, follow another ancestor or use the prompts from FHWC or Geneabloggers, is still to be decided. But I will write. It is what I do. Aunt Alice Brodie was, it seems, our dark family secret. I remember reading a letter from my grandmother’s cousin Douglas asking my mother if she knew anything about his father’s sister Alice. My mother knew nothing, since my grandmother had never talked about her. It seems unlikely that either of the cousins had ever been told about their Aunt Alice, even though Douglas was 10 and my grandmother 13 when Alice died. It is clear Douglas, at least, had no knowledge of her. In his letter to my mother he recalls meeting an “Aunt Alice” in Egypt in 1911 and wonders if this might have been his father’s sister? I now know that it was not. I started to uncover Alice’s tragic story quite by chance. I was on a research trip to Leicester looking into the life of my great-grandfather John Buchan Brodie. It was towards the end of the day and, on my way out of town, I stopped at Welford Road Cemetery to try to find John’s grave. Welford Road is well documented and, after a little searching, I came upon it. The marble cross had been broken off and laid against the base but John’s details were clearly inscribed on the side. And then I realised there was more. On the front, worn, but still clearly legible, were memorials to both John’s mother, Mary, and his sister Alice. It was an exciting moment as I had not been able to find a birth record for Mary, and had found no trace of Alice beyond the 1891 Census. Then I realised that Alice had been just 44 when she died and I became curious as to what had happened. I resolved to get her death certificate to find out, expecting the sadness of a relatively young woman struck down by illness or fatally injured in an accident. What the certificate revealed was much more shocking. Alice Mary Brodie had died in the Leicestershire and Rutland Lunatic Asylum, as a result of epilepsy. I tried to comprehend what this meant. In Victorian England, epilepsy was associated with mental and moral weakness, sometimes even demon possession. Patients were locked away by a society who thought it was contagious and by families concerned to protect their reputations. Alice had died in the Asylum, but how long had she been there and was she committed because of her epilepsy or was there more to it? The Alice I knew to that point was a well-loved daughter and sister. She was born in Mhow, India in 1868, fourth-born child of William John Brodie and Mary Oldfield Wise Brodie, and named for her sister, who had died of convulsions aged 15 months, less than a year before. 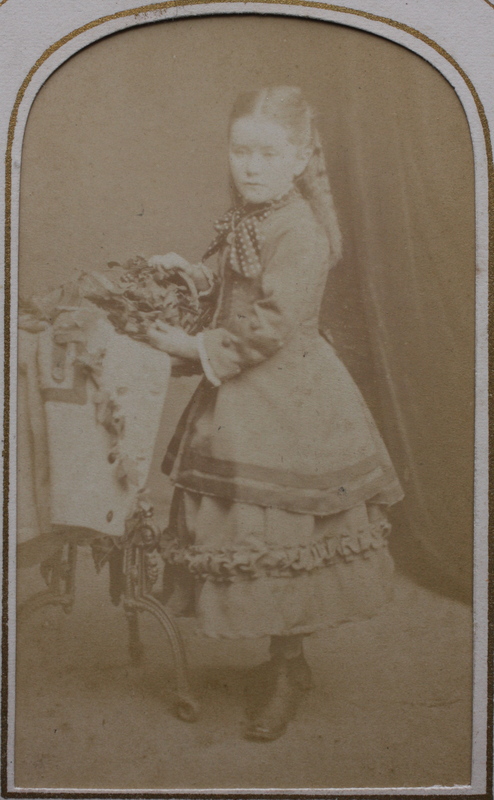 The safe arrival of this new, apparently healthy, daughter must have brought relief and comfort to her parents and excitement to her older siblings, Bessie, aged seven, and John, aged five. The year had started well for the family with William being promoted through the ranks to QuarterMaster Sergeant, responsible for supplies and stores of the Regiment. Such a responsible position would have led to improved living conditions for the family, as well as a “behind the lines” situation. Having been in battle 10 years earlier in the Indian Rebellion, this must have been a welcome development for both William and his wife. But their time in India was drawing to a close. In 1870, William’s regiment, the 95th Foot, returned to England and the 1871 census shows the family living in the new army barracks in Alverstoke in Hampshire. 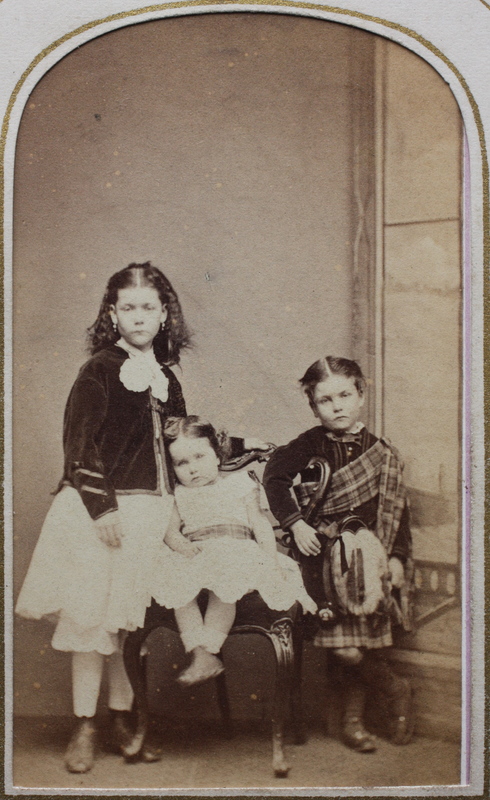 An engaging photograph of the children around this time shows toddler Alice, wearing a tartan sash and leaning against her older sister, with her brother, in full Scottish dress, on her other side. The Brodies were always mindful of their Scottish heritage! In December 1873, William transferred out of the 95th Foot to the Leicestershire Militia and the family moved to Leicester, where their younger son, and last child, Harry, was born in 1875. It seems that the family were comfortably off at that time, certainly with enough disposable income to have regular family portraits taken. 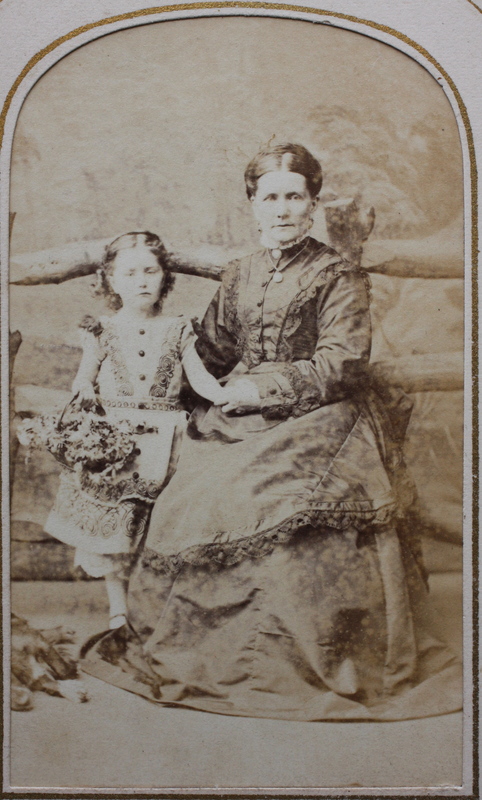 The resulting pictures are poignant and charming: we have Alice, aged about five, with her mother and what appears to be her dog; Alice a few years later, as a young girl, looking very smart in her first solo portrait and a couple of Alice in her late teens, with a solemn, distant expression, typical of photography at a time when exposures were long and sitters had to stay very still. 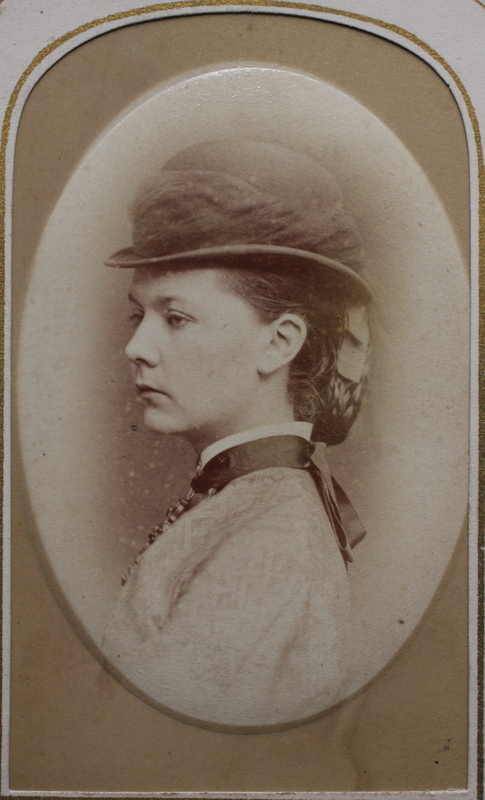 A hint of possible ill health comes in a letter from her mother to her aunt, dated 1880, in which Mary reports that “dear Alice is in much better health”, suggesting that she had not always been so. But otherwise the family appear from all evidence to be happy and relatively successful, with no shadows of what was to come. In 1885, life changed completely for Alice and her family. Apparently without warning or explanation, Alice’s father abandoned his family and left the country to go to America. We can only speculate on the reasons why he left as he did. Family lore suggests that he may have had a drink problem and that he had always been an unreliable scoundrel. But this seems to be largely based on the report of his younger son, understandably angry at being abandoned by his father at the age of 10, and is hard to reconcile with what we know of him prior to his leaving. William spent 21 years in the army and, although he was disciplined on two occasions for minor (drink-related?) offences, he also received five good conduct awards and was eventually promoted to one of the highest non-commissioned officer positions in the regiment. 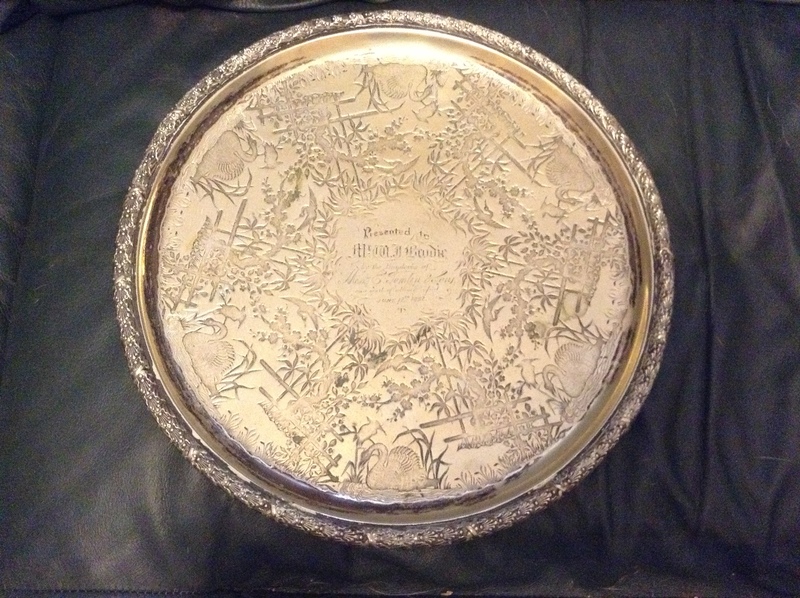 After retiring from the army, he became book-keeper to the cutlery manufacturer Tomlin and Sons and, on leaving after only three years service, he was given an ornate silver-plated platter, which I still have, engraved to him as “a mark of esteem and respect”. He went on to manage the Leicestershire Institute for the Blind shop and workshops in Granby Street. This was a live-in post so it is possible that, by this point, he was already estranged from his family. When he left there, in 1885, possibly just weeks before leaving the country, his colleagues presented him with a leather album “… for his great kindness and urbanity to all during his three years’ residence as manager…” While these could be simply social convention, letters from both himself and his wife to his sister over a 20-year period suggest an affectionate relationship between the three of them and a happy family life. It is this that makes his unexplained departure even more shocking. I often wonder whether Alice’s illness was a contributing factor to his leaving. Later medical records suggest that she was already suffering from epilepsy around this time. Attitudes to epilepsy and the impact of the condition on Alice herself, with the very limited treatment available, may have been more than he could cope with. It does seem that in later life he suffered from “melancholia” (a contributing cause to his death 15 years later) so it is possible that his own mental health made it harder for him to accept Alice’s illness. Whatever the reason, William left his wife, and four children, when Alice was just 17 and Harry still a boy. The impact of this both emotionally and financially must have been enormous. It seems to have sent shock waves through the family, with William’s sister changing her will shortly afterwards to provide for Mary and her children. The only income the family would have had at this time would have been that earned by John and Bessie who were both teachers, but both were young adults who were planning their own independent lives. In 1888, Bessie, the eldest daughter, married Harry Carver, a clerk at the time but with political ambitions, who later became Mayor of Leicester. My great-grandfather John had already moved from Leicester to become Headmaster of a school in Weston-Super-Mare. In the summer of 1889 he returned briefly to marry his Leicestershire bride, with their first son born in January 1890. The 1891 Census shows Bessie, her husband and baby girl living three doors away from her mother, sister and younger brother. John is visiting his mother’s family (his own family are still in Weston-super-Mare). Neither Mary or Alice is working, so the only breadwinner in the household is 15 year-old Harry, working as a warehouseman. The household also includes a nurse, possibly helping to care for Alice, but more likely for her mother. When we consider the census alongside the gravestone, the reason for John’s visit home becomes clear. His mother Mary was ill and died less than two weeks after the census was taken, leaving Alice and 15-year-old Harry alone. The loss of her mother must have been a huge blow to 22-year-old Alice. It was Mary who had cared for her through the seizures and the resulting injuries; Mary who had protected her from the condemning eye of a society that did not understand her condition; Mary who had kept her at home and out of institutions. Mary had been her mother, protector and carer and, without her, Alice was lost. Her asylum admission records suggest that her mental illness started at this point: depression brought on by grief, expressed through angry outbursts. Today we would recognise this as completely natural and offer support and counselling. Sadly in Victorian England it was seen as the beginning of mania and lunacy. Neither of her older siblings offered her a home. Both were relatively newly married with small children so perhaps the prospect of caring for their increasingly ill, and possibly violent, sister was too much to contemplate. Her younger brother was not much more than a boy himself and soon left Leicester to make his own life in the army. Alice was “farmed out”: boarded on farms with strangers paid to take care of her, “care” that is likely to have included physical restraint and containment. It seems that this was the final straw for Alice. Not only was she dealing with her grief at losing her mother and carer, but she was suddenly cast alone in a world that must’ve been frightening and confusing, particularly when she was dealing with recurrent seizures and their aftermath. We don’t know anything about the people with whom she stayed, but she was finally committed to the asylum in 1893 after “threatening those she lived with with a knife”, believing them to be going to harm her. Whether this was entirely the delusions of a young woman suffering a breakdown, as the doctors at the asylum concluded, or whether she had indeed been mistreated in some way and was responding out of fear and confusion, we will never know. We do know she arrived at the asylum with bruises on her arms, knees and thighs, and with a black eye, injuries that could have been sustained during seizures or as a result of assault. By the time she was admitted she was extremely distressed and hysterical. Her admission and the events that led up to it would’ve been terrifying. The Lunacy Acts of 1890 and 1891 required that a person could only be committed to an asylum by a medical practitioner after 6 days of “care and control”. This is consistent with her admission record, where her “mania” was said to have lasted for a week. During this time she was “tied to a chair”. After a week she was taken by cab to the asylum and forcibly dragged out of the cab and into the building. In the asylum she was confused and frustrated. She could not remember events clearly and she reported people insulting her and trying to harm her, including men trying to molest her. It is unlikely that these things were happening in the asylum, but it is certainly possible that she had had some or all of these experiences before and was projecting them into what must have become, for her, a nightmare present. Her case notes from 14 years in the asylum survive. The early entries depict a young woman suffering from severe seizures with increasing frequency, damaged mentally and intellectually by repeated fits, struggling to manage her depression, anger and frustration, but still aware of the struggle. She spends these early days walking outside, doing needlework or – on bad days – in bed. She is often tearful and distressed. One entry describes how she tries to throw herself in the fountain; another how she fights physically with other patients. She injures herself frequently in her seizures, hitting her head and biting her lip, the latter so badly that later she had to have a large section of her lower lip removed, adding facial disfigurement and, presumably, difficulty with eating and drinking to her other problems. The Leicestershire and Rutland Asylum was significantly overcrowded by 1893. Plans were in place for a new, larger building but it was not ready for occupancy until 1908. In the Leicestershire asylum she would have shared a ward with at least 30 other women, quite possibly other epileptics and patients with suicide risk – all those considered in danger of injuring themselves were kept together where they could be watched. She would have had no privacy and little freedom of choice. The wards were designed as rooms off a central corridor, which also served as a day area. There was an outside exercise court, a library and a chapel. Patients were encouraged to work, in the laundry or the kitchen, or on the farm, though there is no evidence that Alice did so, possibly because of the risks from her repeated seizures. Her epilepsy was treated with Bromide and Borax, the treatment of choice at that time, but both are toxic substances. Bromide has since been linked to side effects such as lethargy, reduced mental function and even psychosis. Combined with the damage to her brain caused by continuous and severe seizures, it is hardly surprising that her mental condition deteriorated. Later entries are depressing in their repetitiveness. She is described as irritable and awkward, slow to respond, unoccupied and fitting with ever increasing frequency, until her seizures are happening nearly every day. The tone of these reports is very unsympathetic: no recognition of her illness, the impact of the drugs she was taking or the traumas she had experienced. She was simply viewed as an awkward and lazy inmate. The records for her final years in the asylum are missing, perhaps mercifully. In 1908 she would have moved from the buildings she had grown accustomed to, to the newly built asylum. I can imagine that this too added to her confusion, moved from an environment that she knew, to having to get used to a new ward and possibly new companions. Alice died of the effect of epilepsy in February 1912, after 19 years in the asylum. We have no record of her having visitors over this period but her sister Bessie is given as her next of kin, and I like to believe that her older sister visited her on occasion; possibly her brothers too, when they returned to Leicester. What we do know is that in death they took care of their sister. Alice finally left the asylum and was laid to rest in the family plot beside the mother who had looked after her and whose loss had had such a devastating impact on her life. We’ve now had a whole week of the Family History Writing Challenge. How is it so far? Well I have stuck to my pledge to write at least 250 words and am moving rapidly towards my first 2000 words. I quickly realised that my original idea of doing an A-Z was not going to work for this, as I got too deeply into my first story. So instead I am going to focus on covering the lives of two or three key women in much more detail and from different perspectives. I still like the A-Z idea – maybe I’ll make it a series on this blog – but not for this challenge. I’m planning to finish my first version of Alice’s story over the weekend – I will post it here. Then I am going to attempt a “fictional” version from her perspective so that I can explore the emotional side more closely. But today I am taking a break from Alice. The prompt from the Family History Writing Challenge today asks us to think about someone we regret not talking to more when they were still alive. For me this was my grandmother, Alice’s niece, Margaret Evelyn Campbell Brodie. She lived in the same house as we did from the time I was a small child, occupying one half of the big Georgian terrace that my grandparents had bought, while we lived in the other, let to my parents for a peppercorn rent. My grandfather died in my first year of university and my grandmother became increasingly frail. She clung to routine, needing her meals at set times, so on vacations at home I would go downstairs to have afternoon tea with her at 4pm prompt, to allow my mother (her main carer) the chance to have more than a few hours out of the house. Physically frail she may have been, but her memories were in tact and we did occasionally talk about her family, prompted by the Brodie silhouettes that hung over her fireplace, or a letter she had received from one of the cousins. Once she wrote out a fragment of her family tree on a scrap of paper, a treasure I still have which helped me get started on my genealogical journey. But I didn’t appreciate the opportunity I had to really listen to Grannie and get to know her. I wish I had asked her about her family, about what she knew of her father and mother and their fathers and mothers, and of the mysterious Henrietta Campbell, whose name she still carried. I wish I had asked about her experiences as a young woman in the First War and whether she really did design dazzle camouflage for battleships; about her art and her writing; about why she went to Canada to teach in the 1920s and what it was like to make that journey alone. I wish I had asked her about how she met my grandfather, about their life together and the love they shared; about how she had felt living through a second war, this time with her own daughter to worry about. I wish I had asked her about the books she had read, the places she had been, the people she had known, the events she remembered. But I didn’t. I was young, impatient and full of my own interests and so I let slip through my fingers the opportunity to truly get to know this remarkable woman, who was my grandmother. An important lesson learned the hard way. If you have older relatives, take time to call them or visit. Talk to them. While you can. A brief check in here to say mission accomplished for Day 4. Another 400 words written – some a rewrite of previous sections but all movement in the right direction. What has particularly struck me today is how considering the detail of multiple records simultaneously can throw up new insights. Sometimes the information we need is staring right at us. We don’t always need to seek new documentation – it may be that taking a different lens to the documents we already have will move us forward. For instance, today I discovered (from existing documents), that Alice’s father was promoted a few months before she was born, that the family returned to England from India in 1870 and that they moved to Leicester in 1873. Simply mapping what we know to a timeline reveals more context. This story is taking longer than I expected! I’m on day 3 of the writing challenge. Yesterday I did 278 words and today have written 521, so I am ahead of my pledge, with well over 1000 words, but only just getting going on my story! I have a feeling I may need to rethink my strategy on this one. My original plan was to write a number of short stories for this blog and to try out different approaches to writing family history. I was going to use an A-Z theme – and have my topics mapped out. But I find I am getting caught up in the first story – of my grandmother’s Aunt Alice. So my thought now is to stay with Alice and give her the time she deserves. It may take me a week – or the whole month – but I will do justice to her story. If it means I don’t get past A in February – so be it. I can carry on in March! It is February 1st and the Family History Writing Month challenge has begun. Over the past week I spent some time outlining what I intend to write about and reminding myself of my research sources. Today I started writing. I have committed to just 250 words a day. I hope many days I will write more but I want this to be achievable and some days even this is likely to be a challenge. At that pace I won’t be posting a story a day – but I will post as they are finished and see how far I get. My aim is that, by the end of February, writing this amount will be a habit and I will be motivated to continue. Today I wrote my first 298 words. A good start. So I have decided to write stories here as my FHWC in February but I thought it might be fun to work from a theme – and having found some great posts from other A-Z challenges, I have decided to write my stories on an alphabet theme. Seems ideal for February – gives me a couple of spare days – and if I find stories running over a few days then I can spill the end of my alphabet on into March! So I will be telling stories linked by letters, starting February 1st. I’ve decided to take the plunge and take part in the 2013 Family History Writing Challenge this year and get this blog – and my family history writing – kick-started. The challenge is simple: to commit to writing your family history each day throughout February. Aside from that remit, it is pretty flexible. How much to write, the style, the focus, all down to individual choice. I have thought a lot about how to tackle this. There are certainly characters in my history that I would like to write about. The mystery of Henrietta Campbell. The tragedy of Alice. The two John Buchan Brodies and the characters who link them. And that is just one family line. There are many others to explore. The Spencer brothers – from 18th century farmer to photographers and publishers in a generation. William Sisson – and the son born on the wrong side of the sheets. The Irish Finlays and their journey from Antrim to Cumberland. The many who fought in wars; the lawyers and the labourers; the family heartaches and the secrets. I thought about concentrating on one family but decided that I want more flexibility. For me, this is not about writing a complete history at this point. It is about exploring family history writing. I want to try out different styles, explore different directions. See what fits. So I have decided to use the challenge to start this blog. Each day through February I will write at least 250 words on an aspect of my family history. This may be a person or a family. It may be a profession. It may be a document that has proved vital. Some days will see a completed story; others, where I am working on a story behind the scenes, will see just an update on my challenge. At the moment I am not sure where it will take me. But I am excited by the possibilities.